The caller i.d. read Rio Grande when the phone rang last Thursday and I immediately felt a little flutter of anticipation. I didn’t have anything on order with the company, but I knew that it was about time for the finalists for the 2013 Saul Bell award to be announced. I hadn’t created anything in the past couple of years that I felt was worthy of submission until this summer when I had the opportunity to design my most complex piece to date. 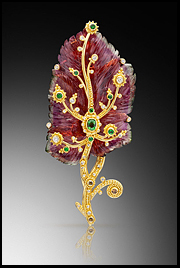 It started with a very large piece of bi-color tourmaline hand-carved to look like a leaf – 96.04 carats to be exact. The coloring of the leaf is predominantly pink but turns to a pale green around the edges and the carving detail is similar to a heuchera (coral bells) leaf. The leaf was purchased by our good friend and client with the intention that I would design an elaborate pin for her. Looking at the leaf and using an actual heuchera leaf as an inspiration, I knew it should have a stem for balance in the design and I wanted to create a webbing of the leaf’s veins that would be an overlay set with small accent stones. I presented her with a series of three distinctively different sketches, however the first of the three designs I had developed was the one I felt the strongest about. As often happens, the first sketch was the one she wanted too and with relatively few modifications. The design portion was very fluid compared to the construction phase. This was a piece that I designed without any concept of how it would all go together. I made a detailed sketch for both the front and the back and I had a a general idea of how the front granulated part would go together, but beyond knowing that the back should be cast, I only had a vague idea on how the two sections would fit together. It was one of those pieces where the answer only became apparent with lots of brainstorming with my fantastic jeweler friend, Tim Green, after the entire front section was completed. This piece never would have been completed without his talent and help. The front of the piece is entirely constructed out of 22kt yellow gold sheet, wire and granules (9 different sizes of granules were used). Working in sections, I fabricated the pieces using fusion, forging and granulation techniques. I then soldered the sections together and formed them to fit the contours of the leaf. The five largest of the granules were set with round gemstones (diamonds and chrome tourmalines), a variety of small diamonds were set in smaller granules and an oval chrome tourmaline was set in a bezel. The back of the piece is the “structure” of the piece- this is where Tim’s expertise came into play. The back, with its four prongs that come around to the front, was carved in wax and cast in 18kt yellow gold. The double brooch assembly was fabricated in 18kt yellow and white gold. The front and the back are connected in two places: at the top there is a peg that comes out from behind the top gemstone to rivet into the top of the back structure. The bottom of the front and back pieces overlap each other in a scarf joint and are screwed together with two 18kt yellow and white gold screws. Tim hand-engraved the back with leafy tendrils and I created a custom shield-shaped maker’s mark in granulated 22kt yellow gold. The two screws were the key to fitting the entire piece together. The prongs aren’t true prongs (i.e. they weren’t folded over onto the top of the leaf) because of the delicate nature of the leaf. The prongs engage in keeping the leaf from shifting laterally in the setting and the rivet keeps the top of the front secured to the back, but the screws lock the whole piece together tightly. So now I wait until January to send the pin to Rio Grande and then I wait some more for the live judging round that takes place in February with notification in the first part of March; just when the real heucheras are starting to put on spring growth…..